Polly’s La Mesa is claimed by some to be the first Mexican restaurant in Macon. We were not able to confirm that, but since it opened in the 70’s, it is definitely the oldest. It has also been owned by members of the same family since it debuted. 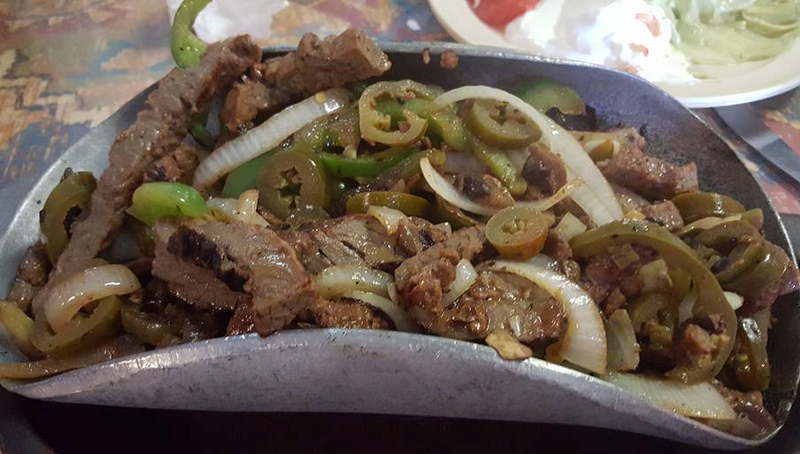 Polly’s La Mesa serves their fajitas in a curved pan with makes keeping it all together very easy. Photo by Doug Deal. Located at 3439 Pio Nono Ave., a mile south of Eisenhower, the restaurant definitely reflects the period in which it was opened. The décor is dominated by wood paneling and style more at home to an era with tab collars and polyester fashion. One could almost imagine Neil Diamond singing about coming to America or perhaps a disco ball hanging from the ceiling. I suspect that alone could turn some people off. It gives the impression that the restaurant is run down, but the times I have checked their health rating has been perfect or nearly so. Many modern looking restaurants have low numbers, so looks are deceiving. Polly’s is a different kind of Mexican. It is not authentic, it is seriously Americanized, and that is not a bad thing. It just another option. I love Mexican food, but I also like to experience something different and not the same cookie cutter restaurant with a “Speedy” and an order by number system that might be the same from restaurant to restaurant. Polly’s does that and they excel on some things that I highly recommend. 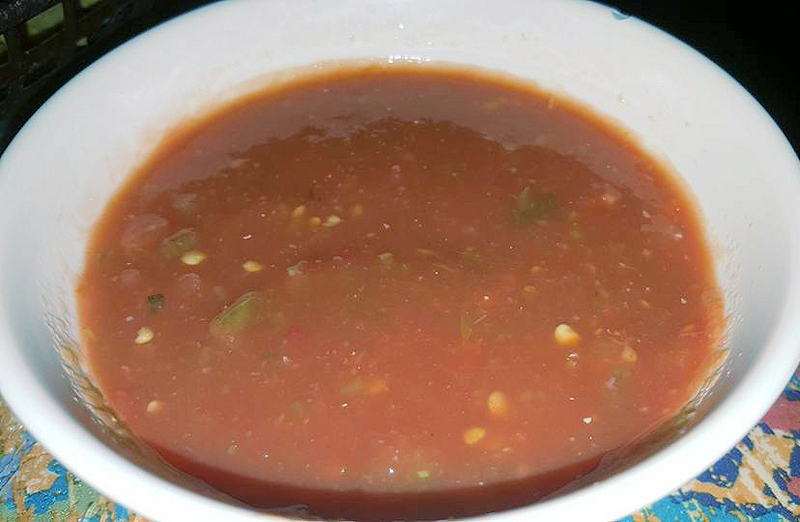 Polly’s standard salsa is hot and delicious. A mild salsa is offered for those who prefer it. Photo by Doug Deal. Of all of the fajitas I’ve had, Polly’s may be the best in town. I got mine grilled with jalapenos mixed in and the meat, onions and peppers were a meal by themselves. It also comes with the normal sides like tortillas, sour cream and tomatoes. Another side is the guacamole. If you are expecting the chopped up guacamole that you get at a lot of restaurants or make at home, this does not resemble anything like that. Polly’s La Mesa’s version is blended smooth, almost like a pudding. My description does not do it justice, but it is actually extremely good with their complimentary tortilla chips or inside a fajita. Polly’s is different, and this is one area it excels. The salsa is also fantastic. If you like heat, their standard salsa is spicy and will get your forehead sweating, but it is also delicious. It isn’t just hot to be hot, the flavors blend perfectly with nothing out of balance. I am not a fan of their mild salsa, but that is available to those with less tolerance for heat. I cannot recommend them to everyone. There are way too many skittish eaters in Macon who like their steaks ultra well done and want to an ornately decorated new building before they are ready to eat. But if you like something different, give them a try and if you order the fajitas, I think you will be satisfied.